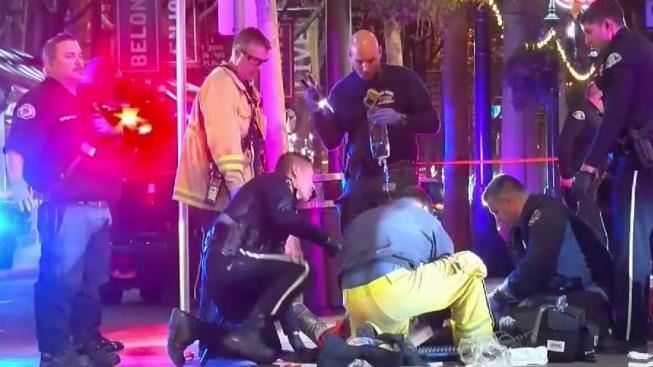 A man was clinging to life Monday night after being shot at a Walgreens store in downtown San Jose, police said. The shooting occurred inside the store at the corner of First and Santa Clara streets about 8:30 p.m., police said. When officers arrived, they found a male suffering from a gunshot wound on the floor near the cash registers. The man was transported to a local hospital with life threatening injuries, police said. A preliminary investigation showed the male was trying to rob the store and was shot by a security guard, police said. The security guard is cooperating with the investigation. Police established a crime scene on Santa Clara Street, between Market and Second streets, and were continuing the investigation late Monday night. Just in. Shooting inside San Jose Walgreens. Sources: Security Guard may have been involved.